Wanna jump for joy with some more adorable doggos? Keep scrolling! Why is puppy breath so irresistible?? If they sold puppy breath scented candles at Bath and Body Works, I would just open the store doors and throw in my money. There would be no time for cash registers. If you’ve ever held a puppy up to your face and took a deep breath, you’d understand. Since a puppy survives off their mother’s milk and nothing more, the only smell that emanates from their tiny tummies is the sugary smell of lactose from mama dog’s milk. That’s why their breath smells like what would happen if a gummy bear could fart. As dogs grow older, their diet becomes more complex (along with the sporadic addition of street garbage), making their breath smell like, well, just a normal fart. If you similarly wish that you could load puppy breath into your Glade PlugIn, you absolutely MUST watch this. When you go in to Lowes, you don’t expect to see a doggo who can lead you to the paint section, but that’s because you’ve never met Charlotte. 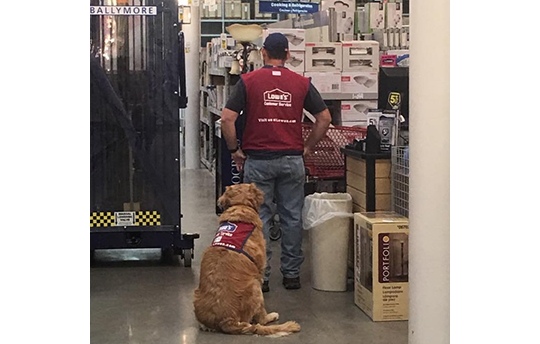 She goes to work every day at Lowe’s where she greets customers, kisses children, and makes sure that her human, Clay Luthy, is safe. Luthy is a disabled vet who served through multiple deployments in the Air Force. After sustaining a few injuries, Luthy needed a service dog. 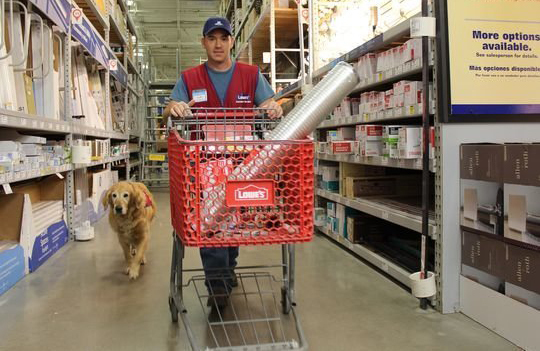 Luthy was having a difficult time finding work that would accommodate Charlotte, until Lowe’s hired the home improvement duo. Now Charlotte is practically the mascot of the Texas store, garnering international online attention for her service and a job well done. I also assume that she is the cutest Lowe’s employee around. But don’t tell HR I said that. This is Remmy and you should probably commit his face to memory so you can say that you knew him when he was just a little bitty pup. At only eight weeks old, this tiny husky knows how to come, sit, and speak. What were YOU doing at 8 weeks? Discovering that you had a thumb?? We’re all so behind. This is a great example of why there are no carpets in my home. Adventurous spirits and nice rugs just do not go together. 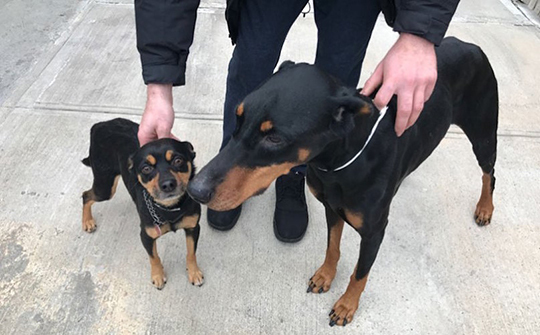 Meet Delilah and Duke, a bonded pair of Doberman Pinscher and Miniature Pinscher-mix lookalikes (one big, one small) who suddenly need a new forever home now that their owner has passed away unexpectedly. Delilah is six years old and just 65 lbs. She had a rough start, as she was rescued from a puppy mill breeder, but she's incredibly sweet, great with dogs and kids, and though she's wary around strangers, she warms up to people very quickly. She loves to cuddle and play, even with the African Grey Parrot she's currently staying with. Duke, 5 years old, had an even more dramatic beginning. He was found as a puppy abandoned outside during Hurricane Irene, hiding under some metal debris in an alleyway. Fortunately, he was saved before any harm could come to him. These dogs are currently being fostered at a home in New York City. If you feel like you could 'em both a home, please email [email protected] and cc [email protected]. Share your love for puppy breath with your friends!